Until last weekend, few Canadians outside La Belle Province had probably ever heard of the town of Lac-Mégantic. Now, in the aftermath of a huge disaster, we all have. Lac-Mégantic is best known among Quebeckers as part of their picturesque cottage country, in the Québecois version of Ontario’s Muskoka. As a railway buff, I’ve known about the town because it had traditionally been a crew change point – once for the Canadian Pacific’s International of Maine Division; now the Montreal, Maine and Atlantic Railway uses a spot a few miles to the northwest to change from Canadian crews to American crews (and vice-versa) for the cross-border journey. 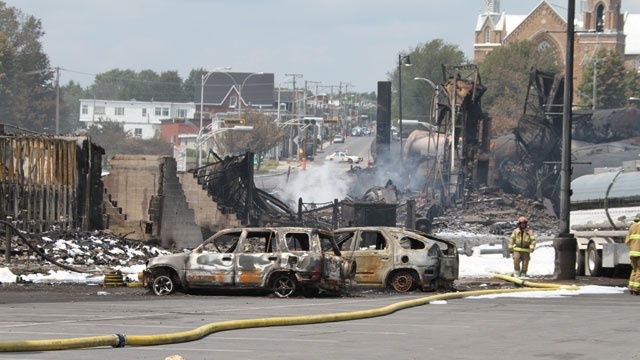 Now, though, Lac-Mégantic is known as a disaster zone, thanks to a cut of runaway train cars filled with crude oil having derailed, crashed, and exploded right in the centre of town. Hundreds of buildings were lost, many people are missing, and the death toll continues to rise. How did this all happen? One of the things human society is really gifted at is pointing fingers. We love to lay blame as quickly as possible – as long as the blame doesn’t land on us. Understandably, the citizens of Lac-Mégantic are upset. To be sure, the management of the railway has not handled the situation well. Investigations by the police and the Transportation Safety Board continue. Until all the investigations are complete, it is unwise to lay blame. After all, trains of all sorts have been rolling through the town for a very long time. Many trains have tied down at Nantes (the spot where crew changes now take place) without incident. Whatever or whoever caused this catastrophe, one lesson we all can take from it is that one simple error in judgment, or one seemingly small prank, can have a ripple effect that has the potential to alter many people’s lives. This is true of many decisions we make, isn’t it? The whole “live and let live” mentality, with which often goes, “Do what you want, as long as it doesn’t hurt anybody”, almost always has consequences we may not know about. I’m sure that whoever is at fault in the Québec tragedy – whether accidental or malicious – had no idea that his/her/their actions would lead to such a tragic and mass loss of life. And we may think that our decisions won’t have that kind of ripple effect. But before you make a decision, stop and ask yourself how it may affect others. You may find that such a pause is more than worth your time. “Don’t worry about anything; instead, pray about everything. Tell God what you need, and thank him for all he has done. Then you will experience God’s peace, which exceeds anything we can understand. His peace will guard your hearts and minds as you live in Christ Jesus” (Philippians 4.6-7, NLT). Let this be our wish for ourselves, and our prayer for those who are affected by the decisions of others, especially those in Lac-Mégantic, Québec.